Simple Green's Single Product, High Flow Proportioner provides accurate and easy product dilution, ensuring concentrated cleaning products are consistently mixed to peak performance. This American Society of Safety Engineers (ASSE) 1055 approved single product proportioner is a high (3.5 GPM) flow model, with an easy-to-use single button unit featuring AccuPro Pressure Regulation Technology to ensure accurate dilution regardless of fluctuations in water pressure. An E-Gap eductor provides backflow protection through use of an elastomeric sleeve. 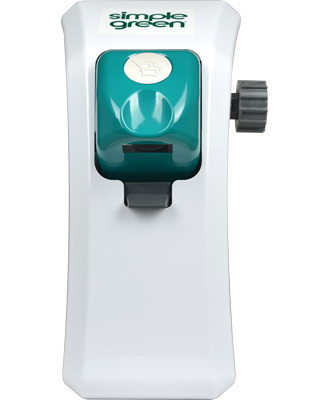 With an option to lock in the on position, 14 pre-set metering tips and a bucket fill hose, this easy mounting unit is quickly ready for reliable dispensing and a lifetime of easy, tool-free maintenance.